This blog post originally appeared at the Imperial and Global Forum in June. It’s reposted with slight edits here for reasons I’ll go into below. On any given weekend, you might find yourself on a train platform, surrounded by sports fans wearing “Native American” headdresses and “war paint,” and waving inflatable tomahawks. They’ll be wearing apparel purchased from the team’s online store (the “Trading Post”), where you can also buy a “Little Big Chief” mascot. During the event, supporters will chant the Tomahawk Chop to get into the spirit of things, and afterward, perhaps they’ll rehash the game on the team’s message boards (“the tribe”). But this isn’t the Atlanta Braves. It’s not the Washington Redskins. This is a rugby match for Great Britain’s Exeter Chiefs, and it’s a problem that evokes Britain’s imperial American past. 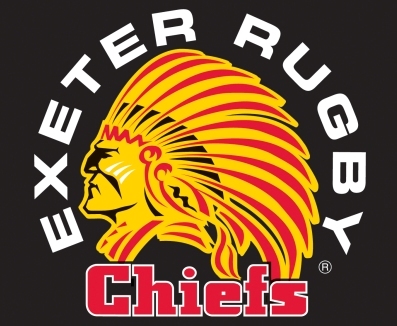 The Exeter Chiefs were called the Exeter Rugby Club until 1999, when they rebranded themselves. Fans had called the team “chiefs” since much earlier in the century, but the Native American apparel became popular after this later remarketing. The team also has an A-League team that (you might have guessed) is named the Braves. The Chiefs’ fan practices, their apparel, and perhaps even the name of the team itself, are problems because they reference the practice of scalping, they erase Native Americans today, and they evoke a history of violent settler colonialism. And it’s an imperial history that belongs to Great Britain as much as the United States. The allusion to scalping is perhaps the least pressing issue with the Exeter Chiefs because of recent historical work related to scalping, but it’s problematic all the same. 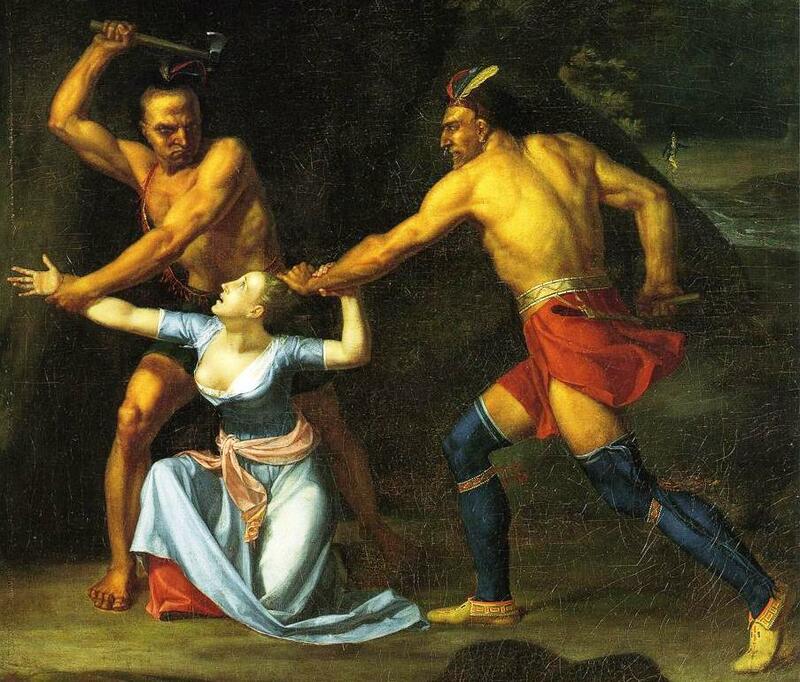 The link between tomahawks and scalping was well-established by 1804, when artist John Vanderlyn painted The Death of Jane McCrea, a woman killed in 1777 by Native Americans allied to the British in the American Revolution. In this painting, one man raises a tomahawk to mete out a death blow, while the other readies a scalping knife while pulling back McCrea’s hair. It’s certainly true that Native Americans scalped people, and that the practice was originally an Indian one, as historians James Axtell and William C. Sturtevant have argued. It’s also true that the American Revolution has been described as a disaster for Native Americans—so much so that the conflict has been dubbed an Indian civil war—particularly among the Iroquois associated with McCrea’s murder, who split into British- and American-allied factions. What rugby enthusiasts might not know is that British colonists in North America also scalped Native Americans, and that by the end of the seventeenth century colonial governments were issuing scalp bounties to encourage non-Natives to kill Indians. In her treatment of the decades-long Washington Redskins controversy, The Junto’s own Mairin Odle has blogged about the history of such state-sponsored violence, which associated one’s enemies with early ideas about skin color and race. Although she concludes that the term “Redskin” is not directly linked to scalp bounties, such names nevertheless remind us that governments in colonial British North America encouraged white colonists to take Native American body parts, mutilate them, and sell them for profit. When Exeter’s fans wave tomahawks in the air, I’m not sure they recognize the violent connotations of doing so. Such controversy over the use of Indian imagery in sports team apparel straddles the line between the past and the present. Exeter Chiefs fans who paint their faces and wear war bonnets also pose problems by participating in a form of behavior that scholar Philip Deloria has called “Playing Indian,” which involves non-Natives dressing up as if they were actual Native Americans. The practice has a long history that stretches back centuries, but one of the most significant examples is the Boston Tea Party in 1773, when American colonists disguised themselves as Indians while throwing tea into the harbor as a protest against British taxation. Deloria argues that playing Indian became crucial during times when Americans sought to form a national identity, and during times of anxiety and uncertainty, as during later periods of industrialization. Playing Indian allowed Americans to define themselves by what they were not—they were trying to avoid being British, and so they appropriated aspects of Indian dress. Making one’s self appear Indian offered people a sense of stability during times of confusion because people perceived Native Americans as unchanging—as stuck in some prehistoric, violence-laden past. Natives Americans, of course, did adapt to changing times, which is why they are still alive today. Playing Indian, however, erases this fact, and flattens the image of the Native American into a moccasin-footed, headdress-wearing, deerskin-clad person, when in fact these sartorial components belong to several different nations. Part of the irony here, too, is that Exeter Chiefs fans who dress like Native Americans are dressing like people who, until 1978, when the American Indian Religious Freedom Act was passed, were legally prohibited from wearing the clothing associated with their religions and ceremonies. Most significantly, the behavior ignores the protests of Native Americans speaking out—over, and over, and over again—against such cultural appropriation. This isn’t political correctness gone mad, nor are Exeter Chiefs fans celebrating a proud, dignified people. The use of Native American imagery today stems from a sense that Euro-Americans have a right to decide what constitutes Indianness, a right to remake it, and a right to profit from it. American land-grabbers, no longer restrained by the handful of British officials (such as Sir William Johnson in the 1750s and 1760s) who sought actively to protect Native land and interests, crossed treaty-sanctioned boundaries to squat on and appropriate Indians’ lands. The U.S. couldn’t officially sanction this policy because of the continuing British presence in the Ohio Valley, the Great Lakes Region, and Upper Canada; the government could not seek to actively exterminate Native British allies. But they didn’t need to, because the actions of former colonists—now violent, land-hungry Americans—took land piecemeal. After the War of 1812, those actions became easier to for the government to stomach. The rhetoric of disappeared Indians set the stage for the formal U.S. policy of Indian removal in the 1830s. I’m reposting this now because late last week the original blog post got picked up by Exeter’s local paper, and then nationally. What I found interesting was how quickly the post was turned from a call to reconsider fan practices into a story about how some academic was calling the Chiefs racist. I don’t think that debating whether or not fans are racist is the best question to ask. Fan reactions have been vehemently in favor of keeping the name and quick to defend fan practices at matches. There have also been some pretty graphic reactions on Twitter. That the Exeter Chiefs fans stop using headdresses, paint, and inflatable tomahawks at games. 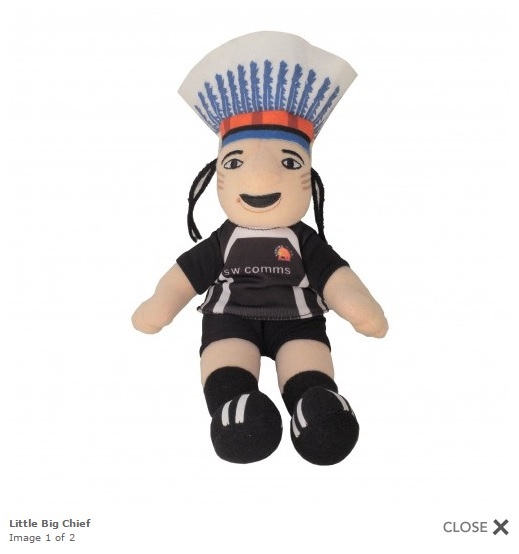 That the Exeter Chiefs stop using the “Little Big Chief” mascot at games. That the Exeter Chiefs stop selling and profiting from clothing and accessories that appropriate and/or stereotype Native American imagery. 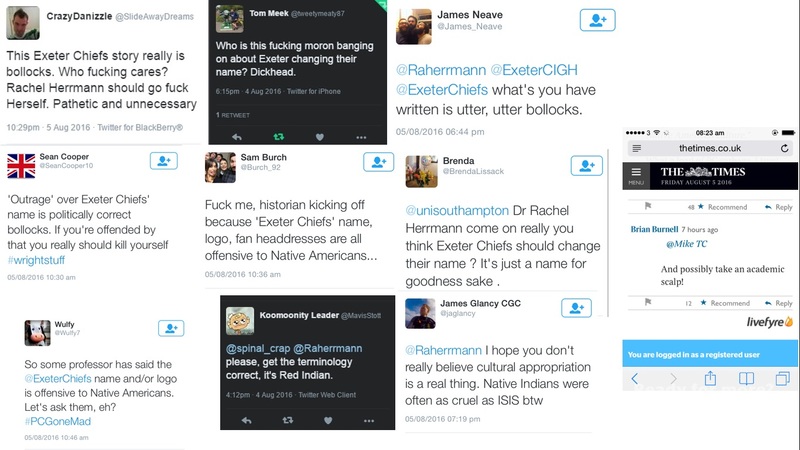 That the Exeter Chiefs get in touch with or listen to representatives from the National Congress of American Indians, the Native American and Indigenous Studies Association, and the Not Your Mascots organization (plus any other groups our readers might suggest), to open up a dialogue about the team’s brand and its name. A signal boost from you, our readers. I want rugby fans to know whether historians, scholars, and Native Americans object to the team and to its fans’ behavior. Historians have gone back and forth about proper terminology for indigenous peoples, and discussion is ongoing. Throughout this piece, I use “Indian,” “Native American,” and “Native” interchangeably, but refer to Indians by more specific names when the sources make it possible to identify them. I have made these decisions based on how Indians in the United States describe themselves today. Barbara Graymont, The Iroquois in the American Revolution (Syracuse: Syracuse University Press, 1972), 151. Historians such as June Namias have commented on the sexualized portrayal of McCrea. See June Namias, White Captives: Gender and Ethnicity on the American Frontier (Chapel Hill: University of North Carolina Press, 1993), 120. James Axtell and William C. Sturtevant, “The Unkindest Cut, or Who Invented Scalping,” William and Mary Quarterly, 37, no. 3 (July 1980): 451-72. For descriptions of disaster see Rachel B. Herrmann, “‘No useless Mouth’: Iroquoian Food Diplomacy in the American Revolution,” Diplomatic History, published early online May 20, 2016, 2-3. For civil war see Colin G. Calloway, The American Revolution in Indian Country: Crisis and Diversity in North American Communities (Cambridge, UK: Cambridge University Press, 1995), 26. John Grenier, The First Way of War: American War Making on the Frontier, 1607-1814 (New York: Cambridge University Press, 2005), 13; Peter Silver, Our Savage Neighbors: How Indian War Transformed Early America (New York: W. W. Norton & Company, 2009), 161-90. Mairin Odle, “Guest Post: What’s in a Name? On Sports Teams and Scalp Bounties,” The Junto: A Group Blog on Early American History, 22 December 2014, available at https://earlyamericanists.com/2014/12/22/guest-post-whats-in-a-name-on-sports-teams-and-scalp-bounties/. Philip J. Deloria, Playing Indian (New Haven and London: Yale University Press, 1998), 2, 3, 7, 183. C. Richard King, Redskins: Insult and Brand (Lincoln: University of Nebraska Press, 2016), 168. King, Redskins: Insult and Brand, 168. Carolyn Eastman, “The Indian Censures the White Man: ‘Indian Eloquence’ and American Reading Audiences in the Early Republic,” The William and Mary Quarterly, Third Series 65, no. 3 (2008): 535-64, esp. 539, 553, 556, 563. Walter L. Hixson, American Settler Colonialism (Basingstoke: Palgrave Macmillan, 2013), 46-86. For the original story see http://www.exeterexpressandecho.co.uk/call-for-exeter-chiefs-rugy-club-to-drop-american-indian-theme/story-29572892-detail/story.html. For follow-ups in this paper see http://www.exeterexpressandecho.co.uk/voters-urge-exeter-chiefs-to-ignore-call-to-drop-red-indian-theme/story-29584910-detail/story.html; http://www.exeterexpressandecho.co.uk/dj-bobby-friction-backs-exeter-chiefs-rugby-club-in-debate-over-offensive-american-indian-imagery/story-29588770-detail/story.html; http://www.exeterexpressandecho.co.uk/7-things-you-might-have-missed-in-the-debate-about-exeter-chiefs-and-their-native-american-brand/story-29590080-detail/story.html; http://www.exeterexpressandecho.co.uk/a-message-for-exeter-chiefs-from-the-cultural-ambassador-for-crow-creek-dakota-sioux-tribe/story-29597102-detail/story.html For national news see http://www.bbc.co.uk/news/uk-england-devon-36965975; http://www.thetimes.co.uk/article/rugby-club-s-racist-name-has-historian-on-warpath-psv0tqpwv. Finally, here’s a radio interview that features a debate on the issue. http://www.bbc.co.uk/programmes/p04175kd. I’m on at 8:35 but stick around for people who are way more eloquent than I am, as well as the guy who tells me that because I’m American I should just go back to America. While the twitter reaction is unsurprising, I think your piece raises some very interesting points. Especially the tendency of such mascots to obscure (if not erase) the continued presence of American Indians and their very real socio-economic struggles. Another notable issue here is the transatlantic-ness of this problem. And I am not sure how deeply you are planning to delve into this issue, but another instance of needed rebranding in Europe can be found in Belgium. An athletic association (though known best for their football team) also has an American Indian mascot–KAA Ghent. Though they go by “Buffalos” rather than Chiefs or Braves, their fans still wear headdresses to matches and their logo is a profile of a plains Indian in a headdress. Their indirect connection to American colonialism, however, may put an interesting wrinkle into how we think about this phenomenon. They changed their name and mascot after Buffalo Bill and his traveling circus visited the city in the 1920s. Recently Susan Shown Harjo has demanded change, specifically citing KAA Ghent’s use of live mascots named “Buffalo Ben” and “Squaw Mel.” Anyway, great work here! Thanks for your comment, Nate. I didn’t know about the Belgium case, which sounds fascinating! I am not sure where I fall on this issue as I can see both sides. I am personally not offended at the Washington Redskins mascot as that depicts an actual Indian. Nor am I offended by the Seattle Seahawks mascot which could be considered an appropriation of Indian culture as well. However, I am greatly offended at the Cleveland Indians mascot Chief Wahoo because it is a caricature of an Indian. If you are going to use an image from history whether it be Indian, British or American I would prefer it not be a cartoonish image. I don’t see the need to waive tomahawks because of the atrocities committed by both sides in scalping. One can argue about the sanctioning of it by the U.S. government but it was sanctioned by tribal governments and/or Indian culture as well so neither side is innocent in this issue. The article is well written – thank you for informing folks that this type of controversy is not just an American controversy but occurs in other countries as well.